Grazing management is when you control the grazing habits of animals on pasture. What animals, how, when, and for how long they graze a pasture determines the species make-up of the pasture and its long term viability, how much forage it yields, and how well the animals perform. Overgrazing and undergrazing pastures is detrimental to plant and animal health, as well as soil and water quality. Continuous grazing is a one-pasture system in which livestock have unrestricted access to the pasture area throughout the grazing season. It is a simple system to implement and manage, with minimal capital investment and movement of animals. If sufficient forage is available, continuous grazing often results in a higher individual animal performance than other grazing systems. However, continuous grazing usually results in poorer forage quality and quantity. Pastures are usually grazed unevenly by livestock, as livestock overgraze the plants they like and undergraze the plants they don't like. Manure is also distributed unevenly. Stocking rates are usually lower. Weeds and other undesirable plants usually persist. Controlled grazing gives the producer more control over grazing animals. It has many different names and variations. Simple rotational grazing is a pasture system in which more than one pasture area is used and livestock are moved to different pasture areas during the grazing season. 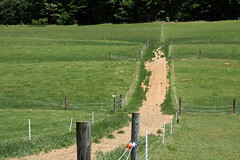 Pastures need rest periods to recover from grazing and allow plants to regrow. The longer a pasture rests, the less infected it will be with worm larvae. Simple rotational grazing usually increases forage yields and quality. Stocking rates can usually be increased. Weed control is better. 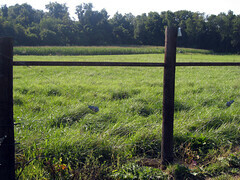 On the other hand, fencing costs are higher than with continuous grazing. Each pasture must have access to water and shelter (or shade). Intensive rotational grazing is a system with many pastures (at least 7), oftentimes called paddocks or cells. 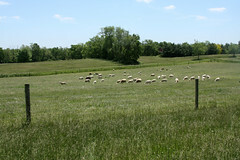 Livestock are moved from paddock to paddock based on forage growth and utilization. The number of paddocks and frequency of rotation depends upon many factors, including the class of livestock and production goals of the manager. After 3 days, livestock will start to graze regrowth of plant material. It is usually recommended that livestock be rotated every 3 to 7 days to a new paddock. Intensive rotational grazing usually results in the highest forage output per acre (or hectare). Stocking rates can typically be increased over those utilized in a continuous or simple rotational grazing system. Manure is more evenly distributed in paddocks. Weed control is better, as animals are usually forced to eat everything in a paddock. Intensive rotational grazing requires a higher degree of management and skill. This is why it is often called "management-intensive grazing." Initial costs will be higher due to fencing materials and water distribution systems. 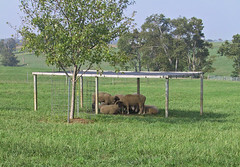 Providing water and shelter (shade) in each paddock can be a challenge. 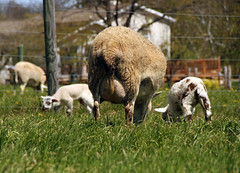 Intensive rotational grazing may exacerbate internal parasitism in sheep and lambs, if pasture rest periods do not allow for sufficient die-off of infective parasite larvae. Strip grazing is a grazing management system that involves giving livestock a fresh allocation of pasture each day. 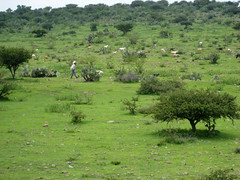 It is usually organized within a paddock grazing system and the animals are controlled by the use of an electric fence. 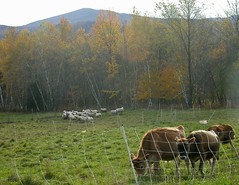 Creep grazing is when young nursing animals are given forward access to fresh, ungrazed pasture through an opening in the fence. To be effective, the forage in the creep area must be superior to the forage in the non-creep area. The greater the difference between forage in the two areas, the greater benefit to creep grazing. In addition to better nutrition in the fresh paddocks, infection with infective worm larvae will be lower. Year-round grazing is possible even in cold climates, though extending the grazing system is probably a more realistic goal for most producers. Tall fescue is the best grass to stockpile for winter grazing. Small grains, root crops, and crop aftermaths are other options for extending the grazing season. Warm season grasses can improve forage availability in the summer, when many cool season plants go dormant. Mixed species grazing is when two or more species of domestic animals are grazed together or separately on the same grazing area in the same grazing season. The rationale for mixed species grazing is based on the principle that animals have different grazing preferences and dietary overlap is minimal in a diverse sward. An additional benefit to mixed species grazing is parasite control. Sheep, cattle, and horses are generally affected by different gastro-intestinal parasites, whereas sheep, goats, and camelids share the same parasites. with the intent to achieve a specific objective. Prescribed grazing can be used to accomplish a variety of land management objectives such as control of noxious weeds and invasive plant species, reducing the incidence of wildfires, rangeland improvement, riparian and watershed management, improving wildlife habitat, and reducing nutrient competition in tree plantations. While sheep have been used for centuries to control unwanted vegetation, grazing as a fee-based service is a relatively new opportunity that is expected to expand as society looks for more environmentally-friendly ways to manage landscapes. Late updated 19-Feb-2018 by Susan Schoenian.